Some ingenious folks in Texas came up with a firmware flash for the Linux-based WRT54G series routers that made them FCC Part 97 compliant on the 13cm band. 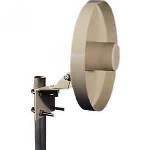 2.402 to 2.417 GHz is domestically allocated to Amateur Radio on a primary basis, so 802.11b/g/n WiFi's 2.412 GHz "Channel 1" becomes our playground. The Ham Radio portion is the antennas and amps, but what is going on within the Mesh itself is pretty much home and SMB networking. So if you're a "plug and pray" person, although you may not be cut out to be the Broadband Hamnet administrator for your area, it shouldn't keep you from setting up your own node for your laptop and joining the party. In an emergency incident, your station could extend the Mesh and make the difference by being the "last mile" to an affected area. Almost everything you want to know about Broadband Hamnet is at their website, so I won't be writing yet another tutorial on flashing the firmware. Instead, I'll show you some pictures and detail how I've set up my six routers. My hat's off to the BH Development Team for making things so easy, including the tutorials thaty have for installing additional services on your network. I constructed the storage frame from aluminum from OnlineMetals.com and stainless steel hardware from The Nutty Company. The base has four 7/8" diameter 1/2" tall rubber feet purchased from SPKR PARTS-2007 off eBay on the bottom secured with #8-32 stainless hardware. 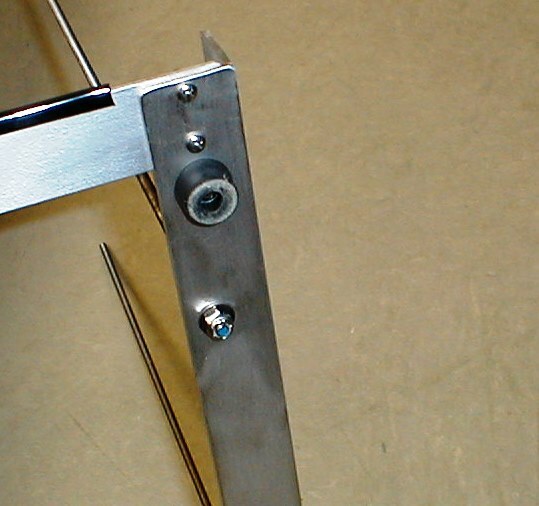 Four 1/4"-20 threaded rods are secured to the bottom angles by plastic insert locknuts. The Mesh Nodes are mounted on clear Lexan panels bought locally and cut to 14.5" x 18" on a table saw with a carbide blade. Since the Lexan chips a bit when cut this way, black automotive door edge trim was used around the perimeter. Holes are drilled in the Node panels so they slide onto the threaded rods. 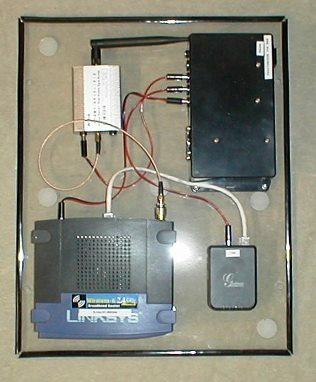 Where the first Mesh Node panel sits, rubber bumpers provide a cushioned base. 1/2" CPVC pipe is then used for spacers for stacking the remainder of the nodes. KJ4AJP-MESH1, a WRG54G v2, is my primary "service" node. An IRC server is installed on it's processor. After trying a few different Chat clients, I settled on HydraIRC and recommend it for anyone setting up their own Nodes in the local area. When you go to the "Mesh Status" page of the localnode you are connected to and KJ4AJP-MESH1 is online, you will see the Chat Server as an Advertised Service link. Clicking on that link will open your HydraIRC client and configure you to the server automagically. I retired an Addonics NAS 4.0 adapter from my home network and now use it for two 32GB USB thumbdrives. 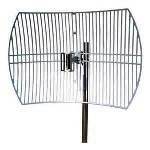 When attached to the Mesh, you will be able to access these to upload and download files. 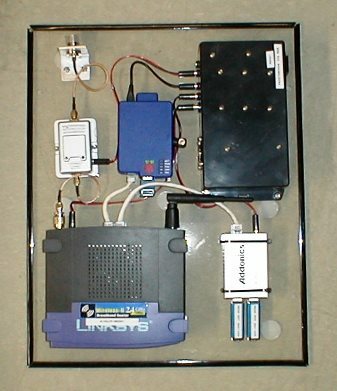 The small blue box behind the router is a Raspberry PI computer running FreePBX, providing a VoIP telephone system across the Mesh. Each of my nodes has an extension number, 10x, where x is the node number (example, to call Node 6, dial 106). I use an old Lynksys SPA922 phone on Node 1. Each PBX extension has a Voicemail box. Since Node 1 is configured as the Internet Gateway for the Mesh and thus assumed to have connectivity to the internet, I have a Google Voice number for calls to and from public telephones off the Mesh. If you're a licensed Amateur Radio operator and have a Mesh Node of your own in the local West TN area and would like a telephone number off the KJ4AJP PBX, let me know. You can use it with either a hardware phone like I'm using or with a free softphone client like 3CX or X-lite when we're all on the same Mesh. The silver box to the left of the PBX is a 2W Broadband RF amplifier, available from Amazon or eBay. North of it is a chassis-mount female "N" conncector on a piece of aluminum L. Since the amp has SMA conncetors in and out, there is a RP-TNC to SMA adapter on the router. Note the second RP-TNC jack on the router has the stock rubber duck antenna on it. KJ4AJP-MESH2 and KJ4AJP-MESH3 are set up the identically. KJ4AJP-MESH2 is a WRT54G v4, KJ4AJP-3 a WRT54GL v1.1. 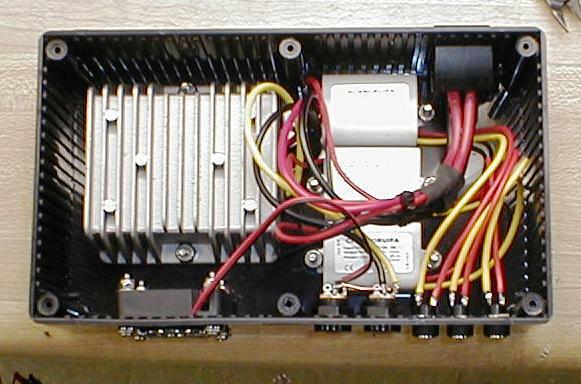 The power boxes are similar to KJ4AJP-1 except for the outputs configured for the peripherals. 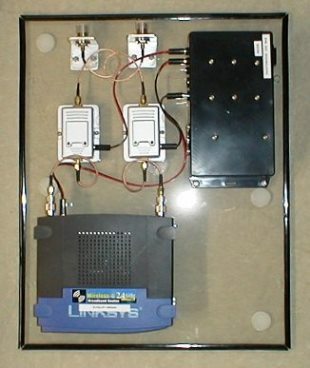 Since these are designed as Relay nodes, both antenna ports have amplifiers so directional antennas can be attached in an "in and out" configuration. The device to the right of the router is a Grandstream HT-701 Analog Telephone Adapter to allow a standard analog telephone to access the VoIP service. I use inexpensive AT&T 210 Trimline phones. KJ4AJP-MESH4 is a WRT54G v2.2 and designed as a Relay node. The setup lacks the HT-701 ATA, instead a Grandstream GXP1100 SIP phone is used. 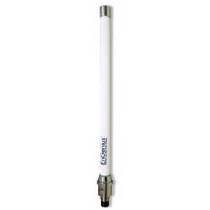 KJ4AJP-MESH5 is a WRT54G v2 and designed as the Endpoint node so only one RF amplifier is installed. It also uses a Grandstream GP1100 SIP phone, so no ATA is installed. 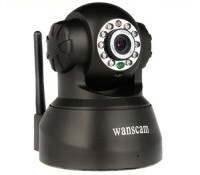 In addition, a Wanscam JW0008 IP netcam is configured and given a clickable link as an Advertised Service. This allows any computer attached to a Mesh LAN port to view the camera's output in a web browser plus control the camera's pan and tilt. It should be noted that this camera is advertised as having audio in and out. It does, but the quality was horrible in my tests. However, the camera's IR LEDs lit the area better than I expected. The entire rig pulled .83 amps at 13.8 volts when idle. Playing with the camera's pan and tilt drew an additional .15 amps per motor, so the maximum current seen was 1.13 amps. 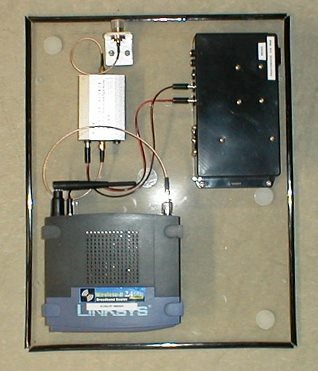 KJ4AJP-MESH6 is a WRT54G v2 and designed as a Mobile Rover using an automotive magnet-mount 7dBi omnidirectional antenna. The mag-mount uses a SMA connector so no chassis-mount N connecter is needed. 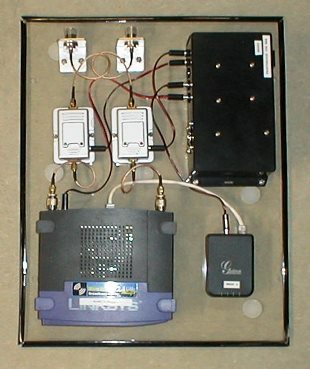 It includes a HT-701 ATA for use with an AT&T 210. 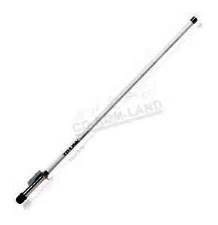 It also includes provisions for a second Wanscam JW0008. You may note the absence of a second antenna on the rear. This unit was missing that when bought used. I soldered a 50 ohm resistor onto the router's printed circuit board to act as a dummy load. 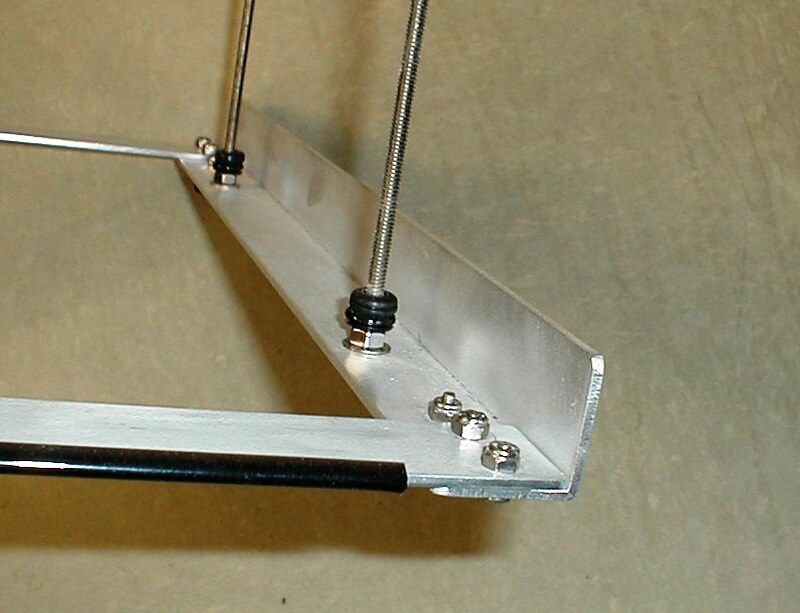 Current draw with both the camera's pan and tilt motors operating is 1.17 amps. 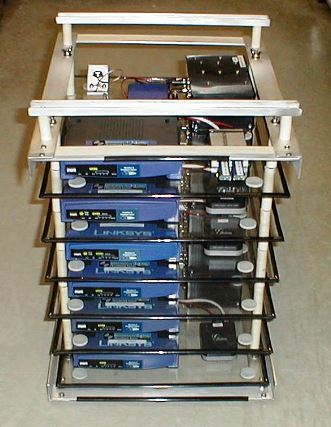 I considered mounting everything in 19" rack mount cases rather than on the Lexan panels. One strike against that idea is that the routers must boot first to be able to DHCP IPs to the peripherials, so power switches would need to be installed or a power sequencer designed and built. Strike two was with the limited bend radius of the coax on either side of the RF amps, making it difficult to find a case deep enough. Strike three was the cost of the cases, regardless of the depth. Although they can be configured in many ways, my basic design thought was to be able to set up both a circular or point-to-point arrangement. For the circular, I have EnGenius 8dBi omnis for the Service and Endpoint nodes and TP-Link 12bBi omnis for the Relays, using only a single port of each node. For point to point, the Service node node has an L-Com 14dBi Backfire, pointing to another Backfire on the first Relay node. The second port of the first Relay would have a TP-Link 24dBi parabolic, which would point to another parabolic on the second Relay. The second Relay would have a parabolic on it's second port, pointing to a parabolic on the third Relay, which would have a Backfire on its second port. The Endpoint would then have a Backfire on its port.